The long hard winter is behind us and Put-In-Bay is officially open for the season! 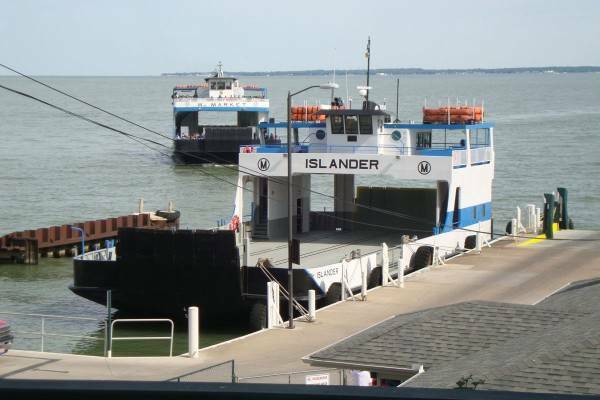 The Miller Ferry left the dock at 2pm this afternoon with great fanfare, making it’s maiden journey for 2015. Islanders and visitors alike rejoiced. We are expecting another incredible summer at Put-In-Bay and welcome you to make your summer reservations now before everything books up! Visit our Lodging Page and check out what is available, or visit our online Calendar of Events to choose a theme weekend for you and your family or group. Pretty soon, the trees will be filled with leaves, the pools will be filled with fresh water, and the island will be filled with the joyful sounds of children and adults alike. Come join us. Have a great day… and we’ll see YOU at the Bay! Do you wish you were down in Key West right now at Put-in-Bay Days? So do we! The island may be cold now for the ice fishermen with incredibly good ice conditions, but it won’t be long before we reopen our doors for the Spring and Summer. Don’t forget to make your room/cottage reservations and if you don’t have one yet, Make a Golf Cart Reservation as popular weekends will definitely sell out each day!! The 56th annual Progressive Mid-America Boat Show, Ohio’s largest winter boating event, will dock in Cleveland’s I-X Center this weekend, January 15–19, repeating its highly successful 5-day format for the third consecutive year. This year’s show will cover nearly 20 percent more exhibit space with nearly 400 boats from small inflatables to 45-foot motor yachts. 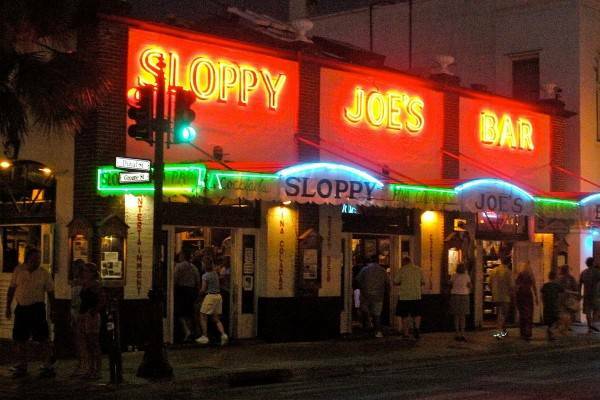 The show kicks off big on opening night with a party in the Put-in-Bay section featuring island favorites Mike “Mad Dog” Adams, Ray Fogg, Westside Steve and lots of The Boardwalk’s infamous lobster bisque. But the music doesn’t stop there. Last year, two party crashers showed up unannounced to join their friends on Put-in-Bay Night – Pat Dailey and Alex Bevin – the biggest names in the logbook of island entertainment. Who knows, maybe they will pop in again this year!?! As always, for hotel and rental home reservations, check our Put-in-Bay Lodging or call 419-285-3101 (hotels) or 216-898-9951 (homes). It’s official! The tall ship Brig Niagara is scheduled to sail to Put-in-Bay Ohio for the next 5 years. 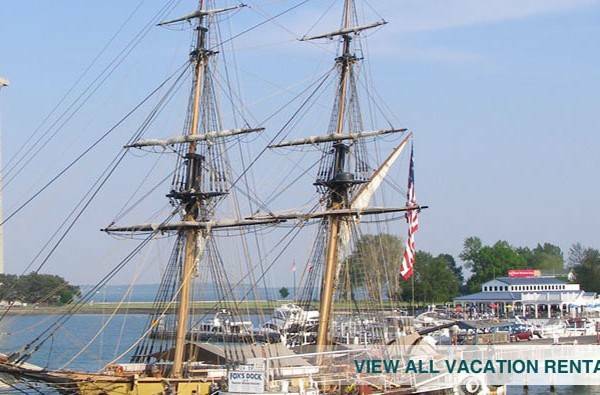 The Flagship Niagara is scheduled to visit Put-in-Bay on the third weekend of June in 2015, 2016, 2018, 2019 and 2020 as part of the Put-in-Bay Pyrate Fest (in 2017, it will be in dry dock for maintenance and refitting). 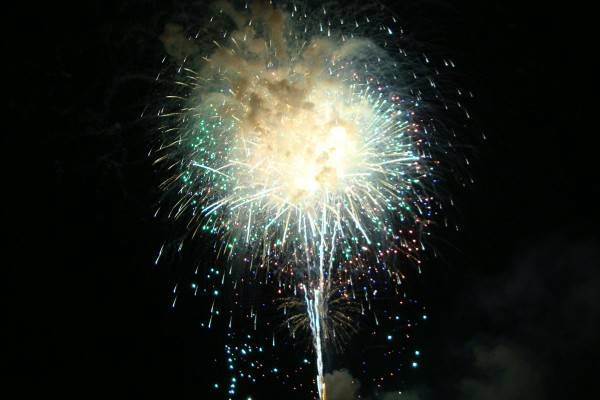 For more 2015 Put-in-Bay events, check our Put-in-Bay 2015 Calendar to find a weekend that you want to visit. As always, for hotel and rental home reservations, check our Put-in-Bay Lodging or call 419-285-3101 (hotels) or 216-898-9951 (homes). Island businesses decorated for this annual “holiday” weekend. Tinsel and twinkling lights abounded all over downtown, in the park, in the front windows of shops, and all around the bars and restaurants. Not to be outdone, the annual Christmas Eve parade featured a record number of “floats” and good times were had by all. Food and beverage specials in a Christmas in July theme were featured throughout the island and there was much eggnog to be found at The Island Club. 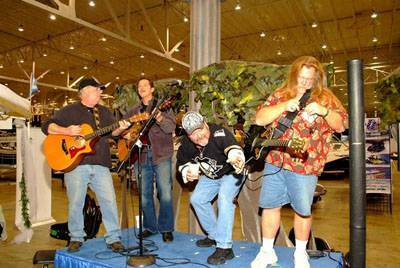 This event is one of the busiest weekends of the year so be sure to make your hotel reservations early for next year! Some people actually booked their room when they checked out on Sunday morning, and many hotels are filled by January for the next year!!! Great live entertainment and nearly the entire downtown area is decorated for Christmas. The Jet Express offers extra late night ferry service for this special event. Thanks to everyone who enjoyed the “holiday” weekend with us! Make sure you get your seat downtown early, as prime spaces fill quickly to view the Fourth of July fireworks, especially at the Boardwalk and at The Keys. This year’s Arts on Erie festival is June 23-28. Each day from 11am-3pm, there will be a kid’s workshop at the Monument visitor’s center. The focus this year is to expose attending children to activities they may not have access to at home. There will still be hands on crafts as well. Monday will kick off the event with a small “Pyrate” craft in addition to a beach glass and watercolor activity. This year’s Arts on Erie will create a huge community project at the end of the week so be sure to attend every day to find out what it will be and add to it! Also, everyone be sure to come to the family concert on the 26th with the Central Ohio Symphony. Afterwards will be an ice cream social at DJ’s! Who wouldn’t want to miss that?! Monday: Beach Glass and Watercolor with Celeste and Jan. Bring your beach glass! Tuesday: Embellish Butterflies with Celeste and Jan.
Movie in the Park at sundown at De Rivera Park. Wednesday: Dance Worshop with Jessica. Thursday: Percussion Workshop with Central Ohio Symphony. From 11am-1pm, ages 8 and under; 1-3pm ages 8 and up. Ice Cream Social following concert at DJ’s Ice Cream. Friday: Improvisation Workshop with Anthony. 11-1pm ages 9 and under, 1-3pm ages 10 and up. Saturday: Tie-Dye with Lauren. (T-shirts provided) Bring your own item to tie-dye too! Ohio’s most popular amusement park, Cedar Point, was closed through the June 7th weekend. This happened after a water main break in the city of Sandusky. It disrupted the primary water supply, putting an initial damper on thousands of summer vacations. This caused havoc to the many summer weekend visitors. Most had planned their trips to Cedar Point for weeks, months, even years in advance. Park officials closed Cedar Point and three hotels on its northern Ohio property on a picture-perfect Saturday. It didn’t expect to reopen until Monday, saying a lack of reliable water posed a safety risk. Many visitors to the roller coaster kingdom didn’t know about the closure until after they arrived. Some after driving hundreds of miles. Alternate plans had to be made quickly and many chose to visit Put-in-Bay for the day and see Perry’s Victory Monument and other island attractions. 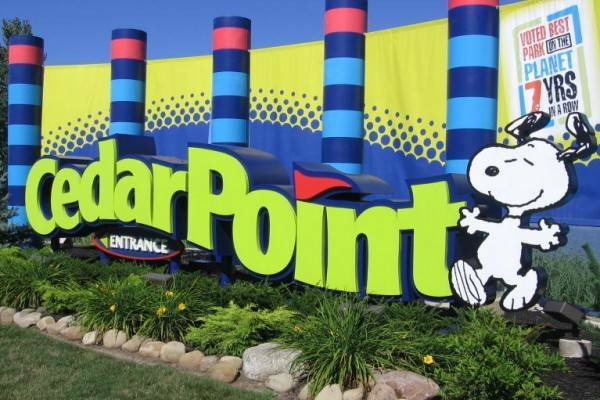 Cedar Point visitors said they waited in line for an hour to get a refund of their tickets. The families who faced long wait times to find a parking spot in the parking lot then got stuck for an hour-and-a-half in traffic as visitors poured out of the park. Even though everyone got a refund for their tickets, they still had to pay for their hotels in nearby Port Clinton or Put-in-Bay, if they could find one. Summer weekends fill quickly at the area hotels. Some savvy visitors went to https://www.PutInBayReservations.com and snagged the last few weekend rooms that were available before they sold out. Put-in-Bay taxi driver, Tony White, said the volume of people coming to Put-in-Bay was higher than past weekends. “The combination of Ohio Bike Week, Mills Race, and the Cedar Point closure had our taxis running non-stop all day. Downtown Put-in-Bay was absolutely packed with families, kids, tourists, bikers, and the usual weekend pool party crowd,” said White. The main Put-in-Bay Facebook page, https://www.facebook.com/putinbayislandguide/, posted pictures of the weekend and it shows a great variety of visitors to the Midwest’s favorite island playground. Cedar Point sees more than 3 million visitors a year, making it the most visited amusement park in Ohio. Put-in-Bay sees a little less than that volume. It was a primary spot for unhappy Cedar Point guests to continue their vacation weekend and have some fun.